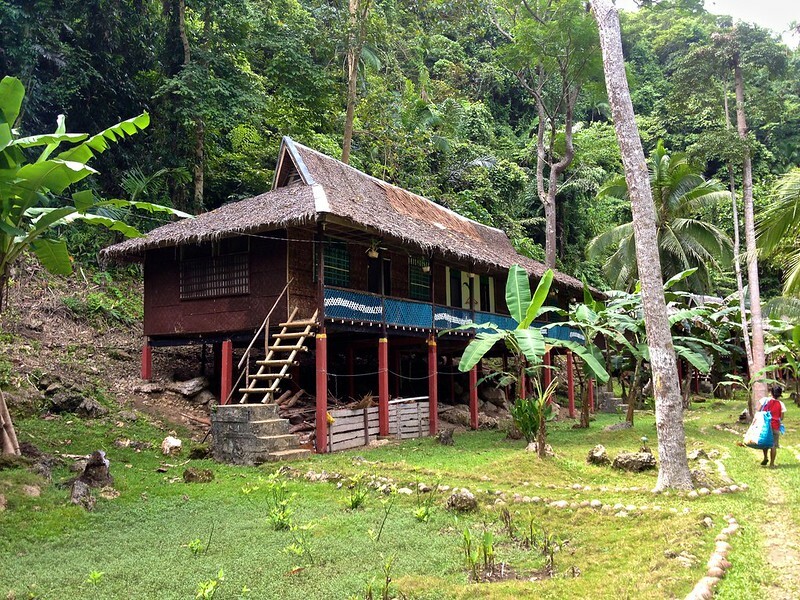 I awoke at 4am in a nipa hut by a jungle river, grateful that I’d not been pooped on by one of the massive geckos in the middle of the night. Seriously, these guys are the biggest damn geckos I have ever seen, even making a loud grunting noise rather than the cute giggle of their smaller brethren, and upon venturing to my hut the night before, I found a giant gecko poop weighing down the mosquito netting above the bed. This I could have dealt with, having grown used to ‘rustic’ accommodations, but the giant smelly wet spot on the sheets below had necessitated that I drag my exhausted self up Nuts Huts’ endless stairs back to reception for new sheets before I could go to sleep. In the slowly lightening gloom, I packed all my belongings, slung on my travel pack, backpack, and satchel, crunched down the gravel path by the sleeping goats that lived rather inexplicably but adorably on the grounds, and lumbered up the stairs to the trailhead back to the highway. And when I say lumbered, I mean slowly waddled, gripping tightly to the bamboo railings, with many, many breaks. Upon victoriously making it to the top, my elation was short-lived, because Oliver was not there. Oliver had rented me his motorbike the day prior, and he seemed to be Nuts Huts’ go-to motorbike guy, since they had arranged that he would meet me at 5am to drive me to Tagbilaran to catch the ferry to Cebu. I waited patiently for a while, before deciding that patience was overrated this early in the morning with transportation deadlines looming, and gave him a call. He answered groggily, and even though he replied that yes, he was on the way right now, I knew I’d probably just woken him. I paced about, stressing uselessly about my tight travel plans for the day, swearing up and down that I would learn from this, that in the future I give myself more time, and never string things out to the very last minute, and as it began to sprinkle, I threw my bags on in a huff and staggered up the trail. I was very nearly to the highway when the sound of a motor preceded Oliver over a hill, and I gratefully packed my bags onto the bike, donned a poncho and helmet, and we skidded quickly along the remaining trail and onto the highway. The drive is about 45 minutes, but we were hindered by the increasing rain, and traffic; jeepneys, trucks, and passenger cars all vying to pass one another, with no care for the motorbikes cruising along at the side of the road, trying to avoid the larger puddles. When driving in the Philippines, the horn is used as a turn signal, a general hello or goodbye, to scare goats or dogs or children off the road, and many times instead of brakes. Sometimes I think my moto drivers have just enjoyed the sound, perhaps accompaniment to some song stuck in their head. We finally pulled into the ferry landing at 6:45am, which was worrisome, because the ferry departed at 7am, and I knew that passengers where supposed to check in at 6:30am, and I hadn’t even bought a ticket yet. As I waited in line I played out scenarios in my head, maybe I should contact the airline, and change my flight now, just in case, as it was I was going to be kinda late checking into my flight, even if I caught this ferry there was no guarantee I’d make it in time. I fidgeted, as some argument at the ticket window ate up minutes. Miraculously, and perhaps because of the fabulous laxness of the Philippines, I finally stepped onto the ferry right at 7am, and was still finding my seat as it began to chug out to sea. Rather than being totally relieved, of course, I was still worried about maybe I should try to check in to my flight online, oh jeez I hadn’t reconfirmed my flight 72 hours before, don’t you need to do that, I’d never missed a flight before, what would I do… once I start stressing, it’s difficult to stop. The ferry pulled in to Cebu City on schedule at about 9am, and I disembarked quickly to find the first taxi to the airport, driven by an amicable old man, who would grumble every time the old car would stall out, which was every time it slowed to a stop, which was frequent in the heavy traffic, all the way to the airport. Upon arrival that the airport, the Tigerair check in desk wasn’t even open, and when it did open twenty minutes later, check in, immigration and security took all of ten minutes, and I sat in the abandoned feeling terminal for a long hour, laughing at my stress, and then mostly being bored, until the plane boarded. If you ever have the chance to have a flight to or through Singapore airport, do take it. Changi International Airport is huge, resembling a giant mall-city somehow built inside a fancy hotel. There is, in fact, a hotel there, along with an entertainment hall, movie theatre, sunflower garden, several spas, an endless horizon of shops, and I’d read there’s even a pool. I, however, was only looking for the SMRT station, which I discovered fairly quickly, and within ten minutes of clearing immigration, I was zooming along towards the city center. 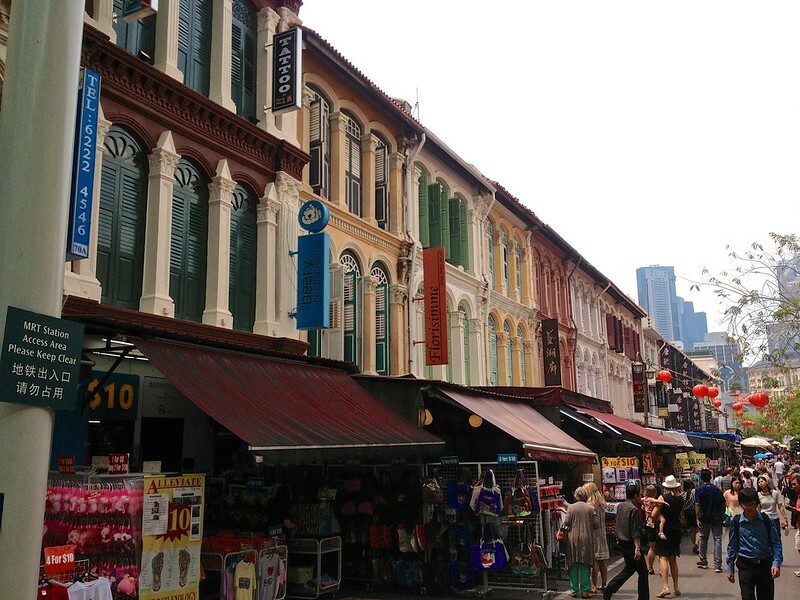 On the plane, I’d consulted the guidebook, and decided that I’d stay in the Chinatown area, as there is a cluster of hostels within a few blocks of the Maxwell Hawker Center, which, if I may be honest, was my main itinerary point in Singapore. In fact, after an easy change of trains, and a slightly confusing exiting of the train station, A Beary Good Hostel was right there at the exit, and I hobbled over and threw myself onto a dorm bed, exhausted but pretty impressed with my insane travel day: six different forms of transportation, and if I could find a trishaw to take me to the hawker center, an epic seven forms—and I really wanted to go to the hawker center, and grab beer as soon as possible. However, there was a little matter of the hobbling. You see, my last day surfing in Siargao, I’d scraped my foot on the reef (for the dozenth time), and I still was a little wounded on the same foot from my motorcycle mishap the week prior, and one or both of those injuries had festered during my Bohol journey and epic transit adventure to the point that my foot was now quite swollen, and walking was increasingly difficult. Thinking that a doctor in Singapore would be rather expensive, I chose to wait until I arrived in Vietnam the next day, and opted to limp to a local pharmacy for disinfectants, antibiotic creams, and bandages. Before I left home for this trip, when I was assembling my travel med kit, fearing dysentery and traveller’s diarrhea, I’d overstocked on Imodium and the like, but so far the most useful bits from the kit have been for my many wounds. Apparently, when set loose from my cubicle, I am incredibly clumsy and accident-prone. On the way, as I caught my reflection in a storefront window, I realized that my hair was a terrible mess, and the sunburn on my face, and general disheveled look, was pretty embarrassing in this metropolitan city, and I wandered into the nearest mall to locate a hair salon. Picking a short do from the selection of styles in the magazine I was offered was a little tough, since every model was Asian, and given the uncooperative nature of my thin, kinda curly, kinda not hair, just about anything that worked for Asian hair would probably be terrible on me. Winging it, I picked a style with some curls in it, and settled into the chair. The shampoo and head and shoulder massage, after such a long day was worth the price of the cut alone, and the effort that the young lady put into blowing out and styling my hair into a giant, frizzy, windblown mushroom was impressive. She declined the tip I offered, and I limped quickly around a corner to smooth down the pouf as much as possible before venturing out into the street, with not even enough time to record a picture for your amusement. 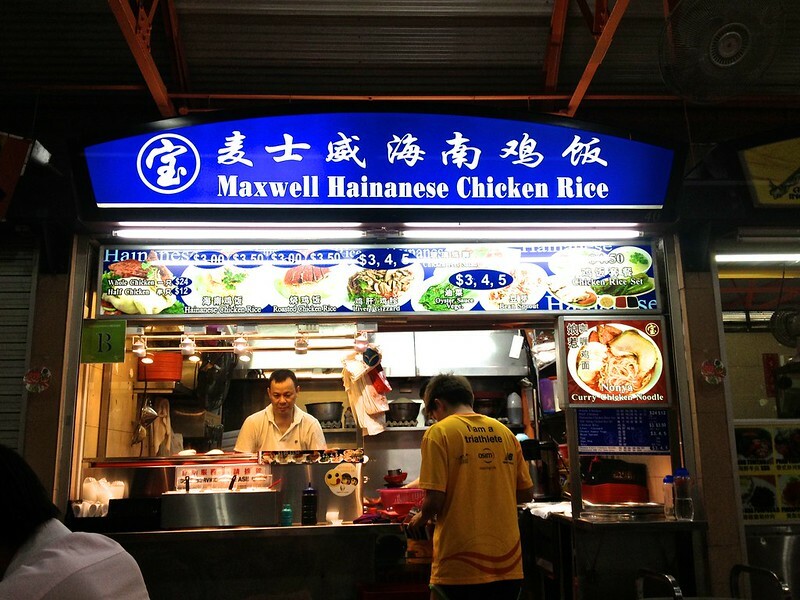 I still had an agenda to keep, and I headed to the Maxwell Hawker Center, which The Internet had told me was one of the very best centers to visit. 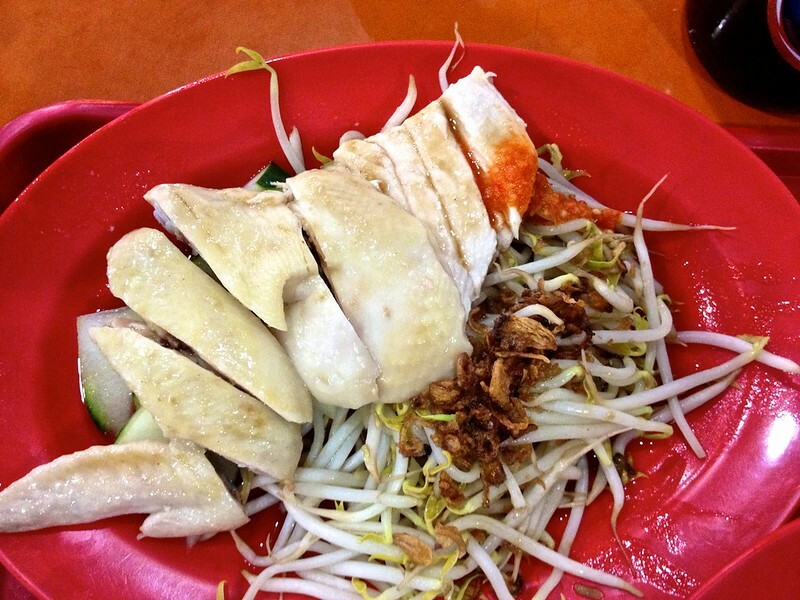 Reports that’s it’s open late are perhaps exaggerated, however, since most shops were shuttered by the time I arrived, and my choice for a chicken rice stand was narrowed to one. Maybe weekends see more action. Hainanese chicken rice is an essential Singaporean dish, and I knew I’d have to give it a try, despite the fact that I am generally underwhelmed by chicken, and the prospect of boiled chicken served over rice that has been cooked in chicken broth did not sound terribly exciting. The chicken is served chopped with little regard to bones and traditional western style butchery, with a bed of the rice, alongside a selection of sauces and vegetables, and I will admit, that despite my reservations, it is pretty damn good. Good enough, that when I am in Singapore again, I will certainly have some more—although, between you and I, I live by the rule that if you put enough hot sauce on anything, it’s great. I washed the meal down with a few Tiger beers, enjoying the city lights after so long in remote corners of the earth, and hobbled off to bed. 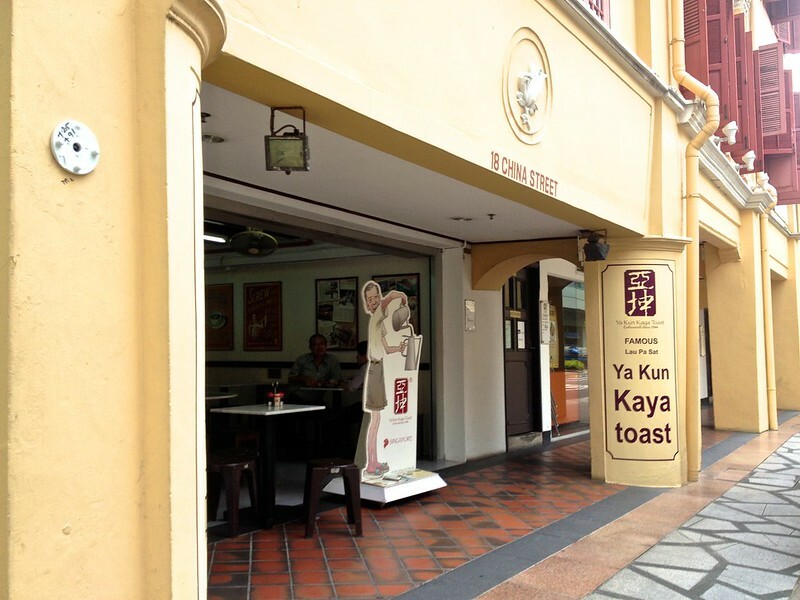 Next on my list of dishes to sample in Singapore was the famed kaya toast, and no place would do, except the historical Ya Kun Kaya Toast. Typically, however, I got lost on the way, and wandering around a business park where I thought the café was supposed to be, concluded that it must have moved, and opted in hunger to visit a coffee shop there instead, having an Americano and chocolate cake surrounded by business folk of all nationalities negotiating negotiations over tidbits. 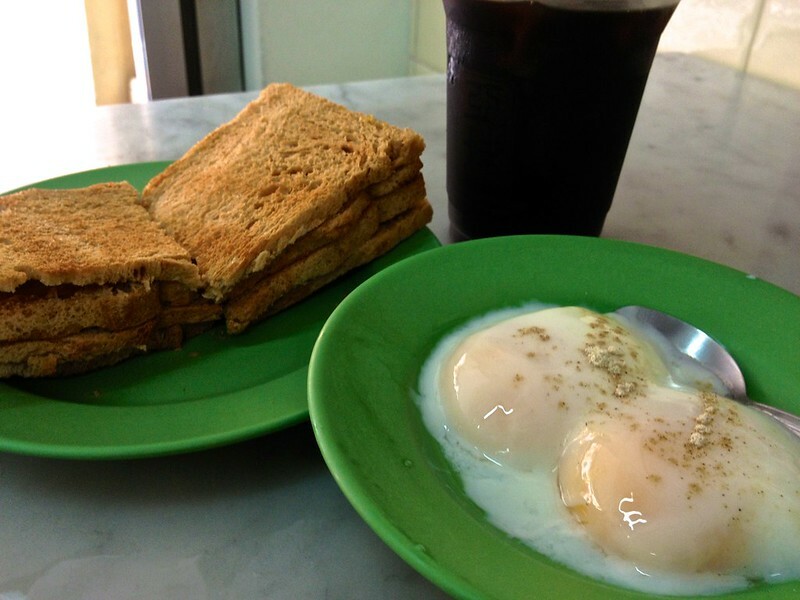 While it was enjoyable to have cake for breakfast, I was still disappointed and decided to wander a little father, exploring the neighborhood, and wouldn’t you know it, I happened upon Ya Kun Kaya, not much father than I’d been, and so I sat down for a second breakfast, of course. An elderly man, who looked like he was the proprietor featured in caricature on the sign out front, served me my iced coffee and kaya toast with runny eggs, and demonstrated how to add pepper and soy sauce to the eggs, and pantomimed slopping up the soupy eggs with the toast—which features kaya, a jam made with eggs, coconut, and sugar, and thick pats of butter. As full as I was already, I powered through the enjoyable, if weird, dish, before, overfull and jittery from double doses of caffeine, I waddled back down the street to my hostel in time to check out, take the SMRT back to the airport, have a drink at a Boston themed bar, and catch my flight to Ho Chi Minh City, Vietnam. Singapore obviously has much more to offer than signature dishes and haircuts, and I look forward to visiting again, perhaps at the end of my trip. Your poor feet. Take care of them. Injuries appear to be my forté, I just earned some scraped up toes trying to learn to windsurf last week, ha (more on that adventure in future posts, promise). Thanks for reading, Anne! I’m so excited and impressed that you are DOING IT! I intend to experience your adventure vicariously so, PLEASE, invest in a pair of sturdy, supportive, protective shoes! Thanks Lou! I’m actually on the lookout for a pair of Cambodian army boots like the pair I was given on a crazy caving tour a few weeks ago. I may have to wait until Cambodia, perhaps. LOL. Runny eggs? Boiled chopped chickens? OK. At least it’s not roasted bugs on a stick. Or, have I spoken to soon… ho-ho. Yes, take care of your feet! Love you. I absolutely love the photos. it makes the whole thing so darn real. Like how on earth do you find and get yourself into a jungle nipa hut and then manage to get out of it and find you way back to the road to civilization where they have runny eggs and band aids ? Well, however it happens, keep up the good work. Your Dad told me about your website. Wow, travel like this is truly for the young! Ha ha, it really is… which is why I’ve slowed down considerably since then! Thanks for visiting!